Cliche lovers say you should stop and smell the roses. I’m on board with that. The Maryknoll Institute where I have classes is surrounded by beautiful gardens and flowers. A few days ago I decided to smell them and take a few pictures along the way. 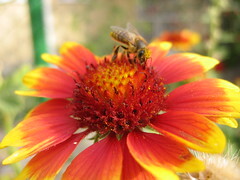 One of them was topped with this pollen-munching honeybee. I think the picture turned out pretty well. Make sure you take the time to do some rose sniffing yourself, even if it’s just metaphorically. I love the flowers. An excellent shot from a spiritual man. Deo gratias.